Melasma, and all types of hyperpigmentation and skin discoloration, can be big challenges to deal with. Sadly, many people become self-conscious of their skin (whatever the issue may be), and even feel embarrassment when going out in public. I also had melasma on my face after a swift hormonal shift. It bothered me for years, until I figured out what to do and it faded away. What helped me was to do everything I could to treat naturally and with love both externally and internally. Rather than feeling that you have hide or disguise yourself, love yourself and your skin. You are beautiful all-ways, and deep acceptance of yourself in the present moment will help you live true to your essence and with love and grace. We can also actively work to heal and transform melasma and hyperpigmentation with internal, topical and lifestyle adjustments. With a little knowledge and effort, melasma can be healed naturally...plus, we will have learned a lot in the process. Read on to learn about the common skin condition known as melasma, and how to correct the imbalance. Melasma is a type of skin hyperpigmentation that causes discoloration over parts of the face. Commonly affected areas are the forehead, cheeks and upper lip. It is very common, affecting around 6 million people in the U.S. alone. About 90% of the people who experience melasma are women. There are many causative factors that can trigger melasma, including shifts in hormonal balance, high stress levels, excess melanin production, high toxic load in the body, and troubles with thyroid function. Many people think that melasma is caused by overexposure to the sun, but this isn't actually true. Sun may accentuate melasma, darkening the hyperpigmentation, but is not the root of the problem. The reason melasma is so much more common in women than men is because of the regular hormonal fluctuations that women experience. When a woman's hormones are balanced, everything functions more smoothly in her life. If any imbalances occur in her body, her hormones will most certainly be affected. And when the hormonal balance is off, we start to notice other things tipping out of balance as well. Commonly, the skin will signal to us a hormonal imbalance. Estrogen-dominance is a common occurrence these days for women. When the progesterone level is too low, estrogen will dominate and cause all sorts of unpleasant effects. Slipping into a state of too much estrogen is not unusual at all in our modern day world, with the rise of xenoestrogenic materials and pollutants in our environment. Our bodies are sensitive, and our hormones can easily get out of balance. Pregnancy is also a time of major hormonal shifts, which is why melasma will oftentimes show up. As a matter of fact, melasma has been termed the "pregnancy mask." Many women experience this hyperpigmentation during and after pregnancy. In addition, the use of birth control pills and HRT can trigger melasma. Again, this is due to the hormonal balance being pushed in the direction of estrogen dominance. So what's one to do once they are experiencing the hyperpigmentation and skin discoloration associated with melasma? I recommend taking a multi-directional approach. By combining lifestyle, internal and topical treatments, you will succeed and soar as you heal this skin condition. The first step is to figure out what sort of internal imbalance you are dealing with, if you don't know already. Work with a health practitioner whom you trust and feel confident in. If hormonal imbalance is suspected, get the appropriate lab tests to find out exactly where you are at. This will help you develop a treatment plan, as well as monitor progress as you undergo treatment. You may also want to have your thyroid and adrenal functions assessed. As you are working through the internal imbalances, you can expedite the external healing process by incorporating an effective, targeted treatment into your protocol. Elaa is honored to be able to offer an extraordinary formulation to those who are healing melasma. Sunshine Dew Brightening Vitamin C Serum is a natural hyperpigmentation treatment that's highly potent and concentrated, for use in the most stubborn cases of melasma, hyperpigmentation, or uneven skin tone. As with all of elaa's product offerings, you will find only the highest quality and most effective targeted ingredients in Sunshine Dew Brightening Vitamin C Serum . It is highly anti-inflammatory, and significantly inhibits the the activity of tyrosinase and melanin production. It heals and restores skin to its most beautiful expression. This type of "Chemical" (100% natural Alpha Hydroxy Acids from fruits) exfoliator, is ideally used with a "mechanical" exfoliator, Pineapple Illuminating Polisher, which further promotes cellular renewal. The two work collaboratively to most effectively reveal fresh, glowing skin. First Cleanse Skin, then apply Glow. To Use with Pineapple Illuminating Polisher, leave Glow on for 20-30 min then apply Pineapple Illuminating Polisher in circular motions to face or area of treatment. Once you have massaged every surface of the treatment area, rinse. Mist with a Toner and finish with a Serum and Moisturizer of your choice. You may do this treatment 1-7 times per week, depending on your skin's sensitivity, and your desired result. Finally, take a deep look at your overall lifestyle patterns. Remember that stress is a trigger for melasma. Stress actually plays a big role in all of our imbalances, including our hormonal balance and adrenal health. Its no mystery that living in our world can feel more than a little overwhelming sometimes. Find ways to nourish yourself by taking the time to make healthy dietary and lifestyle choices. Make a point to consciously relax when you are feeling stressed. Take the time to practice meditation, however this might look for you. Maybe it's being in nature, laughing out loud, or dancing your heart out. I've been talking to several clients lately who are experiencing severely dry and flakey skin. So, I wanted to offer some tips for skin hydration, especially during this cold and dry time of year. 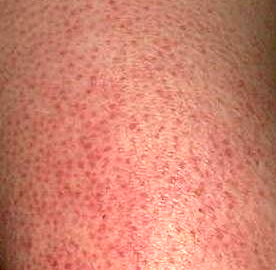 The root of skin dehydration is usually a lack of internal hydration. It's extremely important to stay hydrated all of the time, especially during the winter when there is less of a desire for water and when skin tends to dry out. Drink fluids throughout the day - half your weight in ounces of spring water. If room temperature water is too cool for you, heat it up. Add a squeezed wedge of lemon. Lemon is also great for alkanizing the body and cleansing the liver. I drink hot herbal teas all day long. 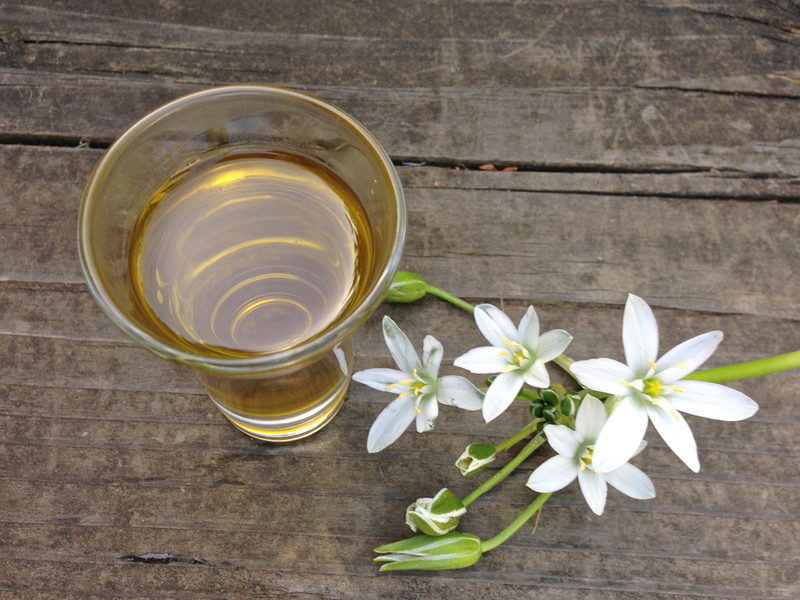 Try more moisturizing herbs in your teas like Irish Moss, Red Clover Blossom, Marshmallow Root, and Fennel Seed. For hydration - to only drink herbal teas, and stay away from caffeine. Caffeine will cause more dehydration Also, try adding raw ginger or a dash of cayenne to drinks or dishes to boost blood circulation and immune function. If you are not getting sun on your skin daily for at least 30 minutes, take at least 4000 IU or more per day. I needed to 10,000 IU when I lived in Seattle. If you are getting sun, still take 2000 IU per day. True and lasting bodily warmth comes from eating the right balance of roots, herbs, and spices for your body. In general, foods that take longer to grow are generally more warming than foods that grow quickly. Some foods and spices that are warming include: squash, carrots, sweet potatoes, yams, rutabagas, turnips, garlic, leeks, onions, cardamon, ginger, cinnamon, nutmeg, cayenne, black or hot pepper. ROOTS like Ginger Root, Astragalus Root, Burdock Root, Nettle Root, Marshmallow Root, Yacon Root, Dandelion Root, Carrot, Rhubarb Root, and many more. BARKS like Cinnamon bark, Pau d' Arco, Slippery Elm Bark, and White Oak Bark. SPICES like Cinnamon, Nutmeg, Cloves, and Anise (These support both intestinal and respiratory function). Also great are Chili Powder, Paprika, Cayenne, Turmeric, and Cumin. Be very cautious not to cleanse skin too often or use a harsh cleanser. elaa cleansers are gentle and nourishing. During the winter, try cleansing no more than once per day. You can also try a mask or spray with a toner and wipe with a cotton pad instead. Rehydrate skin frequently throughout the day with a hydrating mist, which will work even over makeup. I also reapply my favorite moisturizer, like Bee Beauty or Superfood Dream Cream several times per day. If you take baths, bathe with moisturizing herbs such as rosebud, lavender flowers, calendula, and chamomile flowers. Make sure to apply nourishing moisture throughout the day, and especially after bathing when your pores are open and most receptive to moisture. If you implement these nutritional and skin care practices into your daily life, you should see a reversal of your dry skin in no time. And you'll stay nice and toasty this winter. . .
What Makes For the Best Natural Deodorant? Body odor is one of those earthly delights - or offenses - that is intrinsically a part of our daily lives. For many, body odor is a battle. I look at it differently. It may be a surprise to hear that sweat itself is actually odorless. So, what causes body odor? Body odor is created when bacteria proliferates in sweat and breaks down protein into acids. Each person's odor is unique to the individual, but it can be strongly affected by medications, health, and diet. How do conventional deodorants work? Chemical deodorants, antiperspirants, and perfumes work by, essentially, doing battle against our bodies' natural processes. 1. They kill all bacteria that naturally lives on the skin, including beneficial bacteria. Once the balance of bacteria is destroyed, our bodies are left defenseless against pathogen bacteria because healthy bacteria is no longer there to fight it. This causes both susceptibility to infections and bodily imbalances of all kinds, as well as, body odor. 2. They coating the skin in synthetic chemicals and metals, like aluminum, that are toxic to your health, and have been linked to breast and prostate cancer. 3. Antiperspirants block the sweat glands, which has a negative affect on our health. Many toxins and pathogens in the body are flushed out through sweat. Preventing this natural cleansing of the body can cause more infections short term and eventually, create disease. If chemical deodorants, antiperspirants, and synthetic perfumes are linked to cancer, reproductive disorders, and hormonal imbalances, why would we use them? If chemical deodorants, antiperspirants, and synthetic perfumes work against all of the natural processes that help to keep the body healthy and odor-free, why would we use them? It's not really common knowledge in our culture how to care for ourselves without using medications and chemicals to suppress symptoms. It's less common these days that people are in-tune with our natural processes and know how to create a healthy body in the way nature-intended. I certainly grew up using all the conventional drug-store brands, using medications, and eating a sugary processed-food diet. Once I developed multiple chronic diseases, I knew something wasn't right. Once I started eating a healthy, real-food, no sugar diet and removed all chemical skin and body care products from my life, not only did my illnesses resolve, but so did any issues with body odor. I've haven't had any "bad" smelling body odor for over a decade. What are my secrets? I eat an organic, plant-based, no sugar diet. Low odor, healthy foods = a low odor body. A diet high in red meat has been shown to cause body odor. It's also a good idea to limit the potency and frequency of pungent foods like garlic and curry, if your are concerned about body odor. If you do sweat a lot, natural fiber clothing allows air flow and thus has less potential to harbor sweat and bacteria growth. I'm a proponent of excellent hygiene, but not stopping the body's healthy, natural processes - like stripping the body of it's natural oils and good bacteria. Daily bathing and harsh soaps are not good for your skin or its processes (the skin being the largest organ of the body). Instead of showering daily, washing glandular areas of the body, including the armpits, with a warm wet washcloth (and a dab of natural, gentle soap or body wash, if necessary) can help to remove odor causing bacteria. And, finally, I use deodorants that work in beautiful harmony with the body's natural processes. I was never able to find deodorants on the market that did this on multiple levels, so I created them! elaa deodorants promote the growth of healthy bacteria on the skin, and use the by-products that the bacteria produces as an ingredient to co-create a natural and wonderful scent. How do these Deodorants Work? These deodorants are a concentrated, alchemical blend of the most effective deodorizing ingredients available. Wheatgrass is a powerful detoxifier, helping to purify the body. When applied to the underarms over the lymph in that area, it works to remove toxins and eliminate body odor. It is 70% chlorophyll, which is cleansing and healing to the body. Chlorophyll also stops the growth of unfriendly bacteria. Sandalwood inhibits bacteria and stops many harmful microorganisms from growing. It's even used to disinfect entire living spaces and treat many types on bodily infections. It's a powerful anti-inflammatory agent that cools and relaxes the skin. It can help relieve inflammation in nearly every organ, including the delicate tissues of the brain. It's especially active on the circulatory and nervous systems. Aloe Vera is a succulent desert plant. The leaves contain a gel-like substance that has countless rejuvenating properties. It is anti-inflammatory and is one of the most soothing plants in the world. It is a wonderful treatment for skin conditions of all kinds, as well as burns, wounds, and rashes. It also softens the skin and helps to smooth wrinkles and create the look of firmer skin. Essential Oils. There are several scents of this probiotic deodorant to choose from. The aromas of these natural deodorants are glorious, and the essential oils used to create the scents are one of the most significant reasons why these deodorants works so well. The alchemical blend of therapeutic essential oils in each bottle are chosen not only for their scent profiles, but also for their for deodorizing, anti-microbial effects. They kill bad bacteria and promote healthy bacteria. Each essential oil also has multiple skin and health benefits. The amount of essential oils in each bottle is highly concentrated, allowing for superior odor protection, therapeutic benefit, and anointing you with an incredible aroma. I had such oily skin for much of my life, I was even known as the "shiny girl" to people that didn't know my name during my teens. The reason why many people live with oily skin is that people think, understandably, that oil causes oil. But, here's the truth - this is not how skin works. It may seem counterintuitive, but lack of oil causes oily skin. What?! Yes - The most common cause for excess oil secretion is a lack of hydration in and around the skin cells underneath the skin’s surface. When this is the case, the skin’s sebaceous glands try to correct the imbalance or lack of moisture by producing more oil, which makes oily skin even oilier. Typically, this is treated with drying agents that may produce a very temporary effect of having less oil on the skin’s surface (like minutes or maybe hours at most). But, stripping the skin of its natural oils actually causes a serious skin imbalance. Skin is severely thirsty, lacking it's natural oils that it needs to function normally and be healthy, so the body responds by secreted more and more oil through the sebaceous glands to try to once again create healthy balanced skin. But, as long as skin is stripped of excess oils, it will perpetually be imbalanced and will be secrete excess oil to compensate. In my teens and early twenties, I tried every "oily skin" product on the market - products with drying agents that were supposed to create a matte effect on the skin. Yet, my skin was even more oily and was excessively dry at the same time. Finally, I met a wonderful aesthetician in Seattle that told me to moisturize more and to forget oil-free products. I found this advice hard to believe at the time, but I was quickly amazed by the results! Life-changing advice. Ever since, my oily skin disappeared and was replaced by a lovely glow. Why is no one else sharing the actual cause of oily skin? I've wondered if it's to be able to sell "oily skin" products that only act to cover up symptoms, rather than address the root cause. I'm so glad that I'm able to share how to care for your skin, rather than "fight" against oil. Lovingly nourishing your skin and your body is always the solution for better skin. The solution for oily skin is to hydrate and moisturize the skin to give the oil-producing glands a message that they no longer have to produce excess oil to compensate for the lack of skin moisture. Use only natural plant oils and creams and lotions made with these oils. Avoid Lanolin, Mineral Oil, Jellies, Petroleum Products, Synthetics, Chemicals, and heavy emulsifiers or fillers, which can clog pores. Here's to a dewy glow, without the oil slick! Milia - What are they and what causes them? I recently received a request for help from a friend, who had developed milia underneath her eye. She steamed her skin and tried taking saunas to open up the pores and then attempted to carefully expel the milia, but unfortunately the pesky little thing didn't budge. I have also tried to expel milia myself in the past, but I only caused damage to the surrounding skin, while the milia stayed firmly planted in my skin like cement. Fortunately, I did learn that there are several ways to successfully treat milia. In my next article in the series, I discuss the best ways to naturally treat milia and improve your skin at the same time. First thing first, in this article, I will focus on - what in the world are "milia" and what causes them? 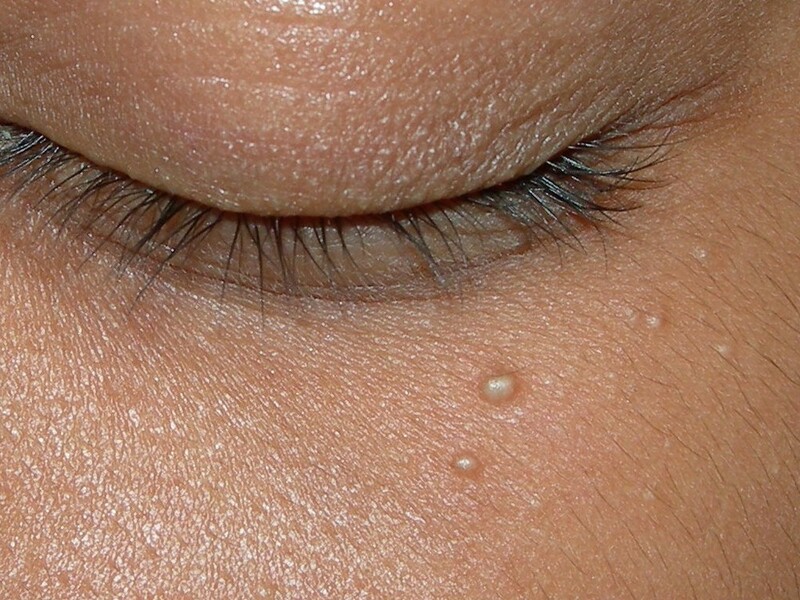 Milia (the plural of millium) are tiny white bumps, or cysts found just below the epidermis of the skin. These cysts can look similar to the whiteheads of pimples, but they aren't. Milia are filled with Keratin, which is is the primary structural fibrous protein that comprises the outermost layer of skin. Milia is most commonly found around the eyes, forehead, cheeks, nose, and chin. There are two types of milia, Primary and Secondary. Primary milia develop when keratin becomes trapped under the skin, and is simply caused by a build up of dead skin cells, because the skin's natural exfoliation process is not properly functioning. Although milia can occur in people of all ages, this type of milia is actually found in 50% of newborn babies because their skin cells haven't yet begun the natural exfoliation process. Infant milia should not be treated, their skin is far too delicate and the milia will go away as the skin matures, usually within a few weeks. Primary milia in adults can be longer lasting, if left untreated. Secondary milia are caused by injury or damage to the skin and are found wherever the injury or damage occurred. Skin wounds, burns, rashes, blisters, or sun damage can either cause damage to the skin pore itself or can cause excess skin cells to be lodged under the skin during the healing process. Secondary milia can also result from anything that too rapidly removes the outer layers of the skin and causes thinning of the skin such as topical steroids and retinoids. Laser treatments or dermabrasion can also potentially cause milia to form as the skin works to heal itself. Now that you know what those little white bumps are, I discuss how to treat them in my next article. Click Here.